Several myths are linked to the origin of rice -- a grain traditionally associated with the farming community in most cultures. According to one, God gave Kachin tribe of Myanmar the first seed of rice and then directed it to the wondrous country where it bloomed. In Bali, it is believed that the Hindu god Vishnu caused the Earth to give birth to rice while a Chinese myth speaks of the cereal as being a gift from animals. Also revered in India, the mystical grain sadly no longer commands respect in its traditional form here. The reason: advent of technologically high yielding hybrid varieties that have slowly started finding favour with most farmers in the country . Nestling between the Arabian Sea near Mumbai and the Western Ghats, the narrow strip of Konkan -- once famed for its rice diversity -- has been a major victim of this onslaught by the new breeds. To conserve whatever varieties are left in the region, Kashele-based Academy of Development Studies (ads) in Raigad district of Maharashtra has undertaken a revival programme with the creation of a rice-bank. The ngo came into existence in 1980, following initiatives by a group of students from the University of Mumbai. While working on the project, designed for the uplift of tribals in Thane district, they realised the need for providing better livelihood to these people and improving the overall ecological condition. This led to the establishement of ads as an autonomous development institution. A detailed survey was conducted for the entire Konkan region to determine the status of traditional varieties of rice and assess the impact of hybrid cultivation on the soil. 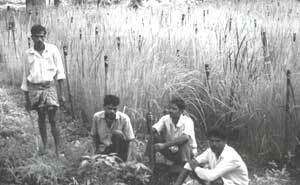 It was found that a widespread genetic erosion had been triggered with the introduction of Ratna, Jaya and other Indian Rice (ir)-researched varieties which had lured the farmers because of their high productivity. Due to widespread use of chemical fertilisers and pesticides needed for their cultivation, soil fertility had degraded to a considerable extent. Risk of epidemics had increased as a result of extensive monoculture with narrow genetic base while cultivation costs had gone up due to more input and less out put from the crop. This resulted in many farmers expressing a desire to revert to the cultivation of indigenous varieties. But by this time, the seeds of most of these types were simply not available. Thus arose the need for improving the availability of the seeds belonging to the indigenous variety of rice. To control the genetic erosion, R H Richharia, former director of Indian Council of Agriculture (icar) and an eminent rice scientist, conducted several experiments by crossing the traditional varieties. "We started collecting indigenous strains in 1990, and now we have more than 370 varieties -- all belonging to the Konkan region," says Bhagwan Mate - one of the many tribals managing the rice bank. For the past many years, the ads has been collecting samples from the four Konkani districts of Thane, Raigad, Ratnagiri and Sindhudurg as well as North Goa. While varieties like the kollum are sparsely grown in certain pockets, mahadi is nearly extinct. Varieties that are conserved include kollum, mahadi, tulsa, borka, bhadas, jhini , and chumansa . The rice is classified on the basis of their maturity -- 'early' that takes 90 days, 'medium' taking 90 to 120 days and 'late' that needs 120 days and more. Of the 350 varieties preserved in the centre, 150 of them are ecotypes (same variety but belonging to different regions). Padu Padir, a villager involved in the management of the bank, says, "We used to cultivate these varieties of rice earlier but realised their importance as plant genetic resources only after the arrival of Richharia sahib. " Most of the farm hands were labourers before Richharia and Rajiv Khedkar, ads secretary, roped them in. Dharma Padi and some others, however, prefer the old traditional varieties citing various reasons as to why these grains are superior to the new ones. Not only do they adapt easily to the local environment, but require less inputs "Again, the crop strand of the kolum is good for roofing because of its length and longetivity, compared to the short-stranded Ratna or Jaya ," says Shankar Kanvi, another farm hand. Moreover, some of the old varieties check soil erosion in the hill slopes. On the other hand, the new hybrids need fertilisers and pesticides that pollute the soil and water. The use of fertilisers itself has long been mired in controversy. But with the cost of inputs going down due to the enormous subsidy given on fertilisers, it appeared to a better option at first. "When the fertiliser was first introduced in the region, sacks of them were distributed free for sale promotion," remembers Kalu Ram. Another problem with the introduction of the new varieties was the entry of pests. "There was no incidence of stem borer prior to this," adds Padir. With the arrival of stem borer, pesticide companies also got a market. "The extensive use of pesticides killed worm-eating fish and frogs that earlier prevented the invasion by stem borer," says Bhagwan Mate. Within the campus of ads and in the surrounding villages, conservation efforts are bearing fruit. Rice seeds and saplings have been collected from the Konkan region. During the first year, only 20 varieties could be collected. But today, more than 300 varieties are present. Every April and May, seeds distribution camps are organised at ads . Farmers come and bring seeds and according to the rule they have to return them either to ads or to a fellow farmer in larger quantity. In this way more diversity is being restored as a number of farmers are coming forward to take up these indigenous varieties of rice for cultivation. Meanwhile, the search for other rare strains continues. The idea is a to evolve a decentralised gene bank for conservation of diversity of genetic material at village community level. Rajiv Khedkar says, "Conservation should be location specific, since specific group of people, on specific locations has been growing the crop diversity for centuries." The rice bank is spread over an area of 1.5 acres which is divided into several grids. A different variety is sown in each grid with nageshwar -- a purple variety of rice, acting as the wall between the two types. "Here we have both the conservation and the multiplication of the variety," says Bahu Bangare, working in the rice bank. Properties of each and every variety has been recorded with 48 different characters. All varieties are stored in bottles in seed forms, on herbarium sheets with complete panical (including the leaves and the grain of the plant) form and in envelopes. The same variety is stored every year to record the changes it has undergone. In the gene bank, it is not only the rice that is documented but also the area and the name of the farmer. The matter does not end with conservation. These seeds are later distributed to farmers from the neighbouring villages "We give about one kg of rice to farmers, and in the second year, we give another half a kg," says Mate. The centre gets a feedback on the status of the varieties in the field. Most of the farmers in the region have small and marginal land holdings and they don't want to take the risk of crop failure. Therefore, the need for the traditional varieties has dwindled. But many farmers are now coming to collect samples after realising that the new ones provided them limited benefits. They are also trying to incroporate the traits of the high yield varieties into the traditional types. Dhabewari is a hamlet of about 18 tribals, some of whom were keen to try the old varieties, which had become extinct. "We have emotions connected with the old rice," says Pandurang Mingal. ads has given jhini to a handful of farmers who are growing it well. They prefer jhini because it fetches a higher market price besides being easily digestible," he adds. The crop doesn't need external inputs and is rainfed. Namdeo Bhiku in Talaikhal village of Thane district is the sole farmer growing mahadi in the entire region. "It's a very special kind of rice with medicinal properties," says Namdeo adding that many people come to collect a kilogram or two for its values. To sow the seeds, the area is first burnt to clear the shrubs by May. Only cowdung, twigs leaves of mahua and shrubs are used to burn the land. This is a special system in the Konkan region, called rab or the 'seed bed preparation', and different from the jhum system of the Northeast. The burnt biomass is spread on the field which in turn eliminates the weeds while increasing the mineral nutrient. No fertilisers are needed as enough nutrients are available from the soil. It was observed that whenever fertiliser was used, then some of the species give only a vegetative growth. Rain starts early June when the seeds are broadcast in the fields. And October and early November is harvest season when people dance to the tune of new rice.